DANA POINT – Heeding a request for more time to review documents by the California Coastal Commission, the Dana Point City Council voted on Oct. 7 to continue a public hearing of the Dana Point Harbor Revitalization Plan and its commercial core. 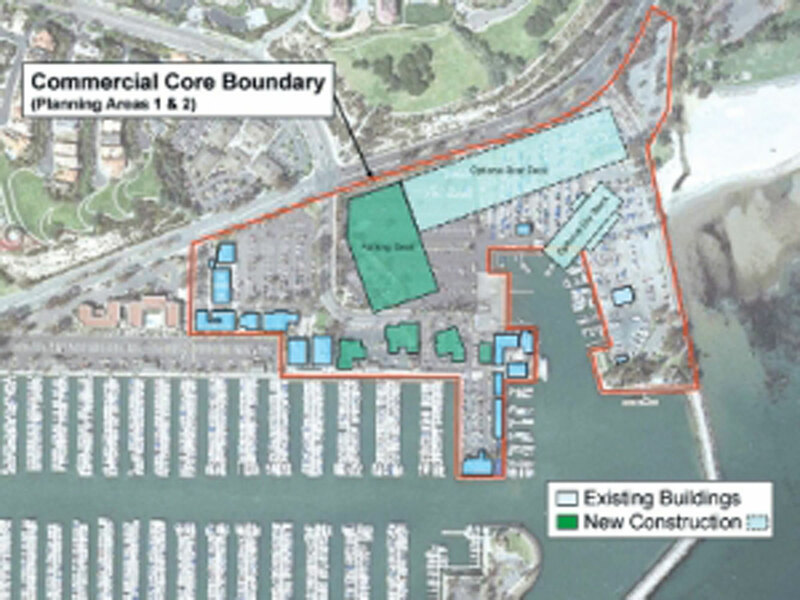 The hearing, continued to Nov. 18, was scheduled because the Coastal Commission received an appeal challenging the city of Dana Point’s approval of the Revitalization Plan’s commercial core project in May. Dana Point Harbor Director Brad Gross said Dana Point’s council members would be reviewing a city staff report addressing modifications to a Coastal Development Permit application. The modifications were made based upon a Coastal Commission appeal. In a letter to the Dana Point City Council, Gross said the time extension was necessary to review key documents and “crucial” to moving the Revitalization Plan forward. Also seeking time and an opportunity to review documents was Rodger Beard, president of the Dana Point Boaters Association. Beard was listed on the appeal as an interested party, as was Bruce Heyman of Boaters 4 Dana Point. On its website, the Dana Point Boaters Association stated it would not receive documentation it requested from the city until Nov. 13. According to the appeal filed with the Coastal Commission, the city of Dana Point did not justify proposed plans to exceed height restrictions or protect coastal public views. A key concern among boaters is where the dry boat storage spaces will be located during construction. “The project as approved by the city does not appear to phase the construction of the Commercial Core in a manner that adequately retains existing dry boat storage spaces during the five-year construction period and relocates all existing dry boat storage spaces to an unidentified off-site location. Further, the project does not retain adequate land area to provide the minimum …  dry boat storage spaces required in the [Local Coastal Program],” as stated in the appeal. Other issues raised in the appeal included whether the city’s approval of the Commercial Core project plan inadequately addressed a flood hazard zone, signage and parking. The Commercial Core project includes renovations and phased demolitions of existing buildings, construction of new commercial buildings, reconfiguration of streets, infrastructure and landscaping improvements, new signage and a two-level parking deck. While Dana Point City Council put off a public hearing for six weeks, earlier in the same day county officials unanimously approved two agenda items to give Dana Point Harbor businesses a sense of security once construction on the Revitalization Plan actually begins. Twenty Dana Point Harbor tenants were given lease extensions and options to help them maintain “merchant quality service delivery” during the construction of new buildings at the waterfront. One lease extension applied to 19 tenants in Mariners Village and Dana Wharf, each of whom are located in buildings planned for demolition as part of the Revitalization Plan. Under the lease amendments adopted by the Board of Supervisors on Oct. 7, the 19 tenants would be given a 20 percent reduction in base rent, the opportunity to negotiate new leases and the option to add another five years to their respective leases. Those tenants who exercise the extension option would be able to remain at Dana Point through June 2020. The 20th tenant, Dana Wharf Sportsfishing, has the option to add another 10 years to its lease, keeping the boat charter company at the Dana Point Harbor through 2032. Dana Wharf Sportsfishing would also be allowed to make improvements to its leased area in the next 18 months. According to county staff, Dana Wharf Sportsfishing differs from the other 19 tenants in that its business is the only one located in a building not planned to be demolished as part of the Revitalization Plan. While the vote gives the tenants some sense of security, the exact start of construction is still up in the air. Bates, whose term representing a district that includes Dana Point expires in a few months, told her colleagues at the Oct. 7 Board of Supervisors meeting she hopes her successor would be able to host a groundbreaking ceremony. One of those potential successors, Robert Ming, said the lease extensions were an important concession. “It will be a painful process during construction. It’s important to incentivize those vendors to stay,” said Ming, currently a Laguna Niguel councilman and supervisorial candidate. There has been some concern, according to a county staff report, of how construction, once started, would impact customer traffic. Conceived in the late 1990s, the Dana Point Harbor Revitalization Plan has been in a holding pattern for about 15 years. The plan would potentially bring an additional 30,000 square feet of retail space and another 35,000 square feet of open space. Seven buildings would be redeveloped, while another 13 would be demolished. The Revitalization Plan also calls for the redevelopment of the existing East and West Marinas–currently home to more than 2,400 boat slips–as well as the expansion of the Marina Inn hotel.